Each of our clients has a story to share. The care we provide is highly individualized, driven by a comprehensive plan of care based on the unique needs of the client and their family. From adult nursing services and pediatric homecare to medical and non-medical eldercare, no two stories are exactly the same. But woven throughout each of them is all that our caregivers make possible for all those we serve – more joy, more hope, more peace of mind. 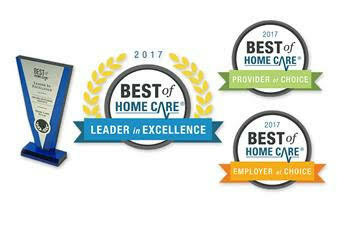 Our Award Winning Service has received many recommendations that we are happy to share with you! "I have used Brightstar annually for a large PPD clinic for about 5 years now and they have always done a superior job. On time, professional, always delightful to work with and will continue to use them in the future. You will not be disappointed with your outcomes." "My family and I stayed at Holiday Inn Orange Lake in Kissimmee. We have 5 kids--three that are a bit older and then two-year old twin girls. We wanted to enjoy the Theme parks without taking the twins along. I called the hotel and they said the childcare service they recommended to their guests was Brightstar. I was hesitant to call a nanny service, but knew if we didn't, life would be miserable at the Theme parks with a couple of two year olds tagging along. I am soooo glad that I made the leap of faith"
"I was more than pleased with the service we received from BrightStar and would highly recommend them to anyone looking for in-home care for a loved one"